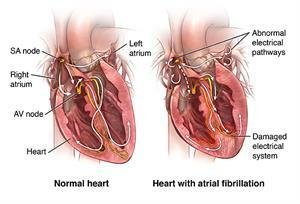 Atrial fibrillation, or AFib, is a kind of abnormal heart rhythm or arrhythmia. Normally, a specific group of cells begin the signal to start your heartbeat. These cells are in the sinoatrial (SA) node. This node is in the right atrium, the upper right chamber of the heart. The signal quickly travels down the heart’s conducting system. It travels to the left and right ventricle, the 2 lower chambers of the heart. As it travels, the signal triggers the chambers of the heart to contract. The atria contract with each heartbeat to move blood into the ventricles. During AFib, the signal to start the heartbeat is disorganized. This causes the atria to quiver or “fibrillate.” The disorganized signals are then transmitted to the ventricles. It causes them to contract irregularly and sometimes quickly. The contraction of the atria and the ventricles is no longer coordinated, and the amount of blood pumped out to the body will vary with each heartbeat. The ventricles may not be able to pump blood efficiently to the body. The quivering atria can lead to blood pooling. This increases the risk of forming blood clots. These clots can then travel to the brain, causing a stroke. This is why AFib significantly increases the risk for stroke. Sometimes AFib occurs briefly and then goes away. This is called paroxysmal atrial fibrillation. AFib that lasts for 7 days or longer is called persistent atrial fibrillation. AFib that lasts longer than a year is called long-standing persistent atrial fibrillation. 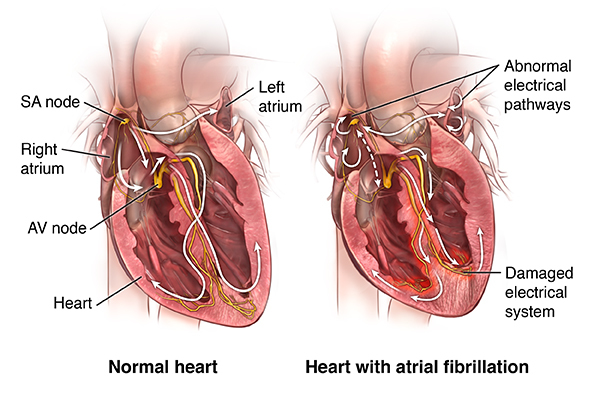 Persistent AFib may be called permanent atrial fibrillation when a decision is made to no longer control the heart’s rhythm or despite best efforts, normal rhythm can't be restored. AFib is common in adults. The risk increases with age. It is more common in men than women. AFib is also more likely to happen during an infection or right after surgery. Stress, caffeine, and alcohol may also set off attacks. People who do vigorous endurance exercises, such as running marathons, can develop atrial fibrillation. Certain people may be at greater risk of developing AFib. This is due to differences in genes they inherited from their parents. This is not yet fully understood, however. AF is more common in people who are over 65. It’s also more common in men than women. Underlying heart disease, high blood pressure, thyroid problems, excess alcohol use, sleep apnea and certain lung disease put people at risk for atrial fibrillation. Sometimes AFib has no symptoms. Diagnosis starts with a medical history and physical exam. An internist or primary care healthcare provider will often makes the diagnosis. You may be sent to a cardiologist for further evaluation and treatment. An electrocardiogram (ECG) is very important for a diagnosis. Healthcare providers use this test to study the heart signal and rhythm. A skilled reader can find AFib using this test alone. If the AFib comes and goes, you might need an electrocardiogram over a longer period with a holter monitor or an event recorder to pick up the rhythm. 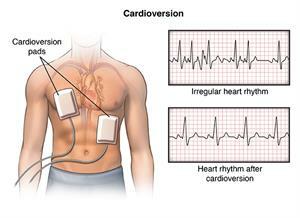 Before other treatment is started, you may first need a procedure called an electrical cardioversion. This can help get the heart back into a normal rhythm. It involves delivering a low-energy shock to the heart to stop the signal that is making the atria quiver. 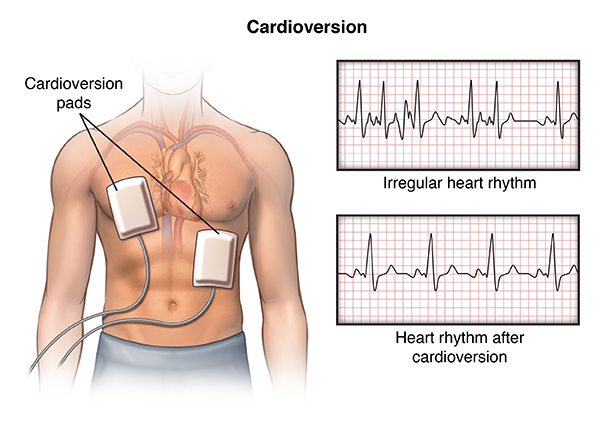 Procedures such as catheter ablation or maze surgery may be used to restore normal rhythm if medicines and electrical cardioversion have not worked. Catheter ablation uses either radio wave energy sent through a wire or a freezing balloon to destroy the small patch of heart tissue that causes AFib. Maze surgery uses cuts or burns in the atria to prevent AFib. In some cases, the conduction node between the atria and the ventricles (AV node) will be destroyed using catheter ablation. This prevents the problem signals from passing to the ventricles. 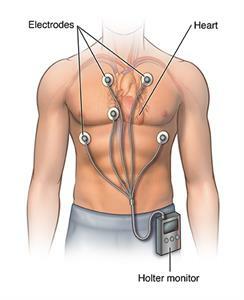 A pacemaker is then put in to control heart rhythm. In the long term, treatment focuses on either controlling the heart rate or preventing the abnormal rhythm. You may be prescribed some type of anticoagulant. What you are prescribed will depend on your risk for stroke. If you are at low risk, you may take daily aspirin. If you are at high risk, you will need a stronger blood thinner. You will need regular follow-up for your AFib. Certain anticoagulants call for more frequent blood tests. Tests such as a prothrombin time (PT) will be needed if you take warfarin. This test measures the time it takes for your blood to clot. It records your reading as an international normalized ratio (INR). Your healthcare provider can change your medicine if needed. Newer anticoagulant medicines may call for periodic monitoring of your kidney function. A medical device is now available that may be considered to prevent stroke if you can't take blood thinners. Called left atrial appendage closure device, it is designed to close off an area in the atrium where most blood clots form that cause stroke. Stroke and heart failure are the major complications of AFib. Blood can pool in the atria during AFib. This can cause a clot. This clot can travel to the brain and block a vessel there, causing a stroke. Blood-thinning medicines help reduce this risk. AFib also sometimes causes heart failure. Because the ventricles are beating so irregularly, they can’t fill normally. The atria also can’t squeeze appropriately, which also reduces filling in the ventricles. In some cases, this means the heart can’t pump enough blood to the body, causing heart failure. A rapid heart rate in AFib, left untreated, will increase the risk of heart failure. Heart failure is treated with lifestyle changes, medicine, procedures, or surgery. Medicines that lower the heart rate will also help prevent heart failure. Controlling risk factors for atrial fibrillation may prevent AFib from developing. This includes managing underlying heart disease, high blood pressure, thyroid problems, sleep apnea and lung diseases. Risk factor control also means making healthy lifestyle choices. These choices include eating a healthy diet, exercising regularly, maintaining a healthy weight, and not smoking. Drink only in moderation. If you have an alcohol abuse problem, consider getting help. There are steps you can take to help you manage your AFib and maintain a healthy lifestyle. Keep your intake of certain foods consistent, like green leafy vegetables, if you have been prescribed warfarin. Eat a heart healthy diet. Be physically active and maintain a healthy weight. Keep your cholesterol at healthy levels with lifestyle and medicine. Avoid the use of alcohol and caffeine (which can trigger abnormal heart rhythms). Avoid certain over-the-counter medicines (which can trigger abnormal heart rhythms). Make sure all your healthcare providers, dentists, and pharmacists know if you are taking a medicine to prevent blood clots. If you miss a dose of a blood-thinning medicine, do not double up your dose. Ask your healthcare provider what you should do. Get emergency medical care if you have severe symptoms like chest pain or sudden shortness of breath. Also get help if you have signs of severe bleeding. See your healthcare provider soon if your symptoms are gradually increasing, or if you have any new mild symptoms or side effects. AFib is the most common abnormal heart rhythm. The atria quiver instead of contracting the way they should. The heart rate usually increases. It is a serious condition, but most people with AFib can lead normal, active lives. You will need to be checked regularly. Follow all of your healthcare provider’s instructions about medicines, lifestyle, and monitoring. You may be treated with medicine to control your heart rate or rhythm. You may need anticoagulation medicine to help prevent a stroke. If you receive certain anticoagulation medicines, you will need frequent blood tests and monitoring. Go to all your healthcare provider appointments.